The TimeCutter ZS features a 19 kW (15 HP) Kohler engine and is available in 2 models. The 74385 has a 32” deck and the 74389 has a 42” deck. With SmartSpeed you get greater control of speed and maneuverability. With the flip of a lever, you can change the ground speed range from high to low without changing engine or blade speed. Kohler® engines are manufactured to withstand the rigors of commercial use so you can be confident the quality and durability of your Kohler® Courage engine will be more than enough to tackle almost any job in your backyard. Kohler® Courage engines have high horsepower and greater displacement for easier starts, reduced noise and less vibration. Mow large open areas in high speed range to finish quickly. Use the low speed range for controlled maneuvering around trees, gardens and landscaping. Independent hydrostatic drive systems provide responsive maneuverability and zero turning capabilities. These independent drives are anchored to Toro’s unibody frame and strengthened with a 1.9 cm diameter cross-bar for lasting durability and performance. The unibody steel frame provides the optimal balance in rigidity and flexibility for quick, highly maneuverable mowing conditions. 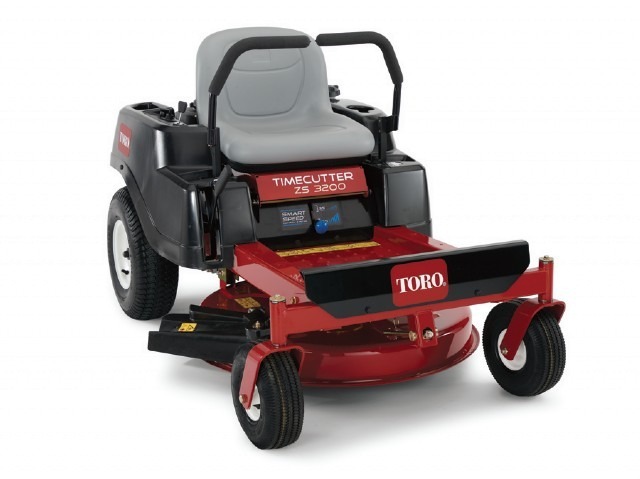 The TimeCutter ZS features a large 11.4 Litre fuel tank for more mowing with fewer fill-ups. Knowing when to fill up is simple thanks to the translucent tank, which also helps to prevent overfilling. Get the job done fast. With a top speed of 11.3 km/h, the TimeCutter® ZS is all about productivity. Whether you want to cut your mowing time or enjoy the ride, the TimeCutter® ZS has the speed you need.